A compilation of violin and viola repertory group lesson ideas, planned to reinforce what is learned at individual lessons at home. This 84-page book is organized according to students' ability levels from pre-Twinkle through Volume 4. Each chapter contains an introduction, suggested warm-up activities, and appropriate ideas for working toward these goals: posture, concentration and coordination, right hand techniques, left hand techniques, and musicality. 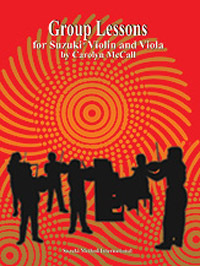 Activities for combined violin and viola groups, and suggestions for the end of the group lesson wrap up each section of the book. This is an attractive and useful book with an emphasis on ideas. Photographs help to illustrate concepts.